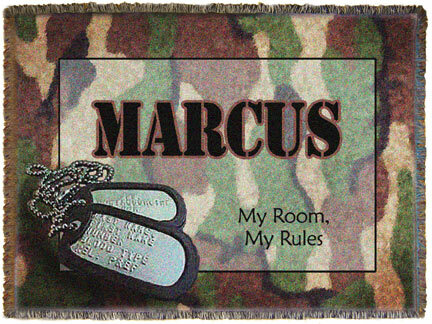 Type the personalized text exactly how you want it shown on your woven throw. Be as descriptive as you can, the text box provided can fit an unlimited amount of text in it. You can use first and/or last names along with dates, a short message or nothing at all. We will leave the rest of the text and format as it is shown. If you would like to change the saying shown on the sample image to one shown on another sample image, type your request into the text box provided. If we have any questions regarding your instructions, we will be sure to contact you with them. You can expect delivery of your throw within 3-4 weeks. Up to 6 weeks during the holiday season. No rush shipping on this item. This item is not returnable.